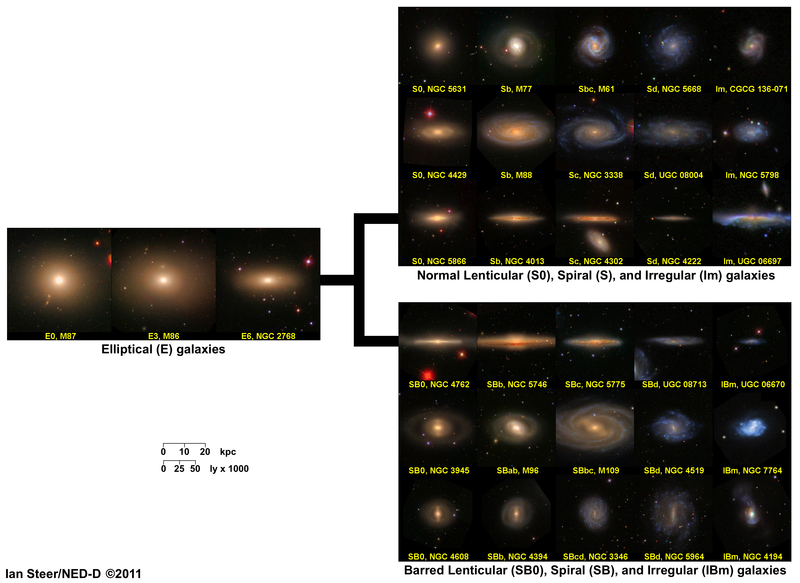 Shows examples of Hubble types with the largest absolute diameters found from among eight thousand galaxies in the NASA/IPAC Extragalactic Database of galaxy Distances (NED-D) that have both redshift-independent distance estimates and published Hubble types. NED-D's mean distance estimates allow examples to be shown with absolute diameters set to a common scale, rather than apparent diameters as usual. NED-D's sample is large enough to provide three-views for all types following elliptical, including lenticular, spiral, and irregular galaxies seen edge-on, at intermediate inclinations, and face-on. All images are from the Sloan Digital Sky Survey, except for NGC 7764 which is from the Digitized Sky Survey (obtained through the Aladin sky atlas).